Anyone following the reports, studies, and news articles about climate change knows of the widely touted claim that our world is literally drowning. However, while the ice caps are melting and the oceans are heating up, it’s hard to imagine the impact of climate that’s physically occurring right now. 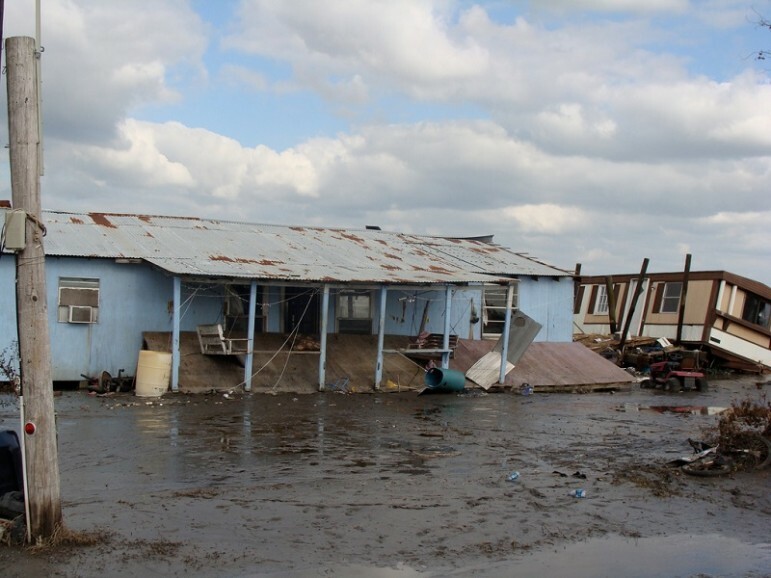 For the residents of Isle de Jean Charles in Louisiana, climate change is very real, and it’s taking place in their backyards. Situated in the webbing of the wetlands in Southern Louisiana, Isle de Jean Charles, a town of about sixty people, has been dealing with the encroaching seas for years as the state’s coast continues to sink. Due to several manmade and natural causes, the coast is slowly becoming a part of the Gulf of Mexico, and if unabated, it’ll be taking towns like Isle de Jean Charles, its residents, and their homes with it. Combined with erosion caused by loggers and now-rising seas, since 1955, about 90 percent of the town’s original land has sunk. As such, the residents will be the first “climate change refugees.” The Department of Housing and Urban Development allocated the town a $48 million grant for the resettlement, which is part of part of $1 billion set aside to help communities living under the threat of rising sea levels. “We see this as setting a precedent for the rest of the country, the rest of the world,” said Marion McFadden, from the Department of Housing and Urban Development who is running the resettlement program. The relocation plan comes amid other substantial state and federal efforts to address climate changing, including the president’s strongly contested Clean Power Plan, which aims to reduce carbon emissions, and the multi-state attorney general coalition to start holding the fossil fuel industry accountable for its part in climate change. Under the plan, members of the community will be voluntarily relocated to another area where a community does not currently exist. All federal funds must be spent by 2022. While giving a community of just 60 people six years to relocate themselves may seem easy, as noted by the New York Times, there are some significant challenges. The town has tried to relocate three times since 2002 with similar plans, and each attempt broke down due to both logistics and the inherent politics of the situation. For example, what about the residents’ jobs? While some jobs may have the flexibility to work remotely, fishermen or those working in Louisiana’s oil industry won’t have the same flexibility. And will the residents still own any of their land when they move? Where exactly are they moving to, anyway? Overly complicating the issue is the attachment many feel to the land. While the move is voluntary, it is only so to a certain degree, as the land becomes more unlivable. Particularly regretful for Isle de Jean Charles is the history that is being lost, inch by inch, into the sea. Many residents are still attached to their homes. For nearly 200 years, the Native American Biloxi-Chitimacha-Choctaw tribe has called the town their home. “We’re going to lose all our heritage, all our culture,” said tribe chief Albert Naquin. “It’s all going to be history.” Edison Dardar, 66, put up a sign at the entrance of the island saying he did not want to leave. With only 60-odd people, one can imagine the issues a town would face moving hundreds or even thousands of people. While Isle de Jean Charles may be the first town of its kind undertaking such an endeavor, it is certainly not the only one, and will not be the last. It’s estimated between 50 million and 200 million people worldwide will be forced to relocate due to climate change, many likely without the benefit of a federally funded package. Some of the world’s most vulnerable people are likely to be impacted not only by rising sea levels, but droughts, flooding, and reduced access to fresh water. As seen with the Isle de Jean Charles resettlement, the plan is to relocate people before they become homeless. Amid climate talks in Paris last year, the UN discussed a proposal to help “climate affected” individuals move, though it was not included in the final agreement.